The stars were sparkling above on a clear night outside of Mammoth. It was cool and pleasant outside, however, I had no interest in how nice of an evening it was. It was Thursday night, the eve of my four day Labor Day weekend climbing trip and my plans had fallen through due to my partner throwing out his back while moving into a new place. Unable to find any suitable last minute trips to join I was determined to find something challenging that I could do solo. So there I was, sitting in my car parked on a giant paved donut off Sherwin Creek Road. Seriously, there's a paved donut hidden in the sagebrush near Mammoth. Take Sherwin Creek road for a mile and take a right at the first obvious opening to the right. In maybe a hundred yards you end up on a 100 yard wide paved circle with shrubs growing in the middle. I have no idea what this was for, but it hasn't been used for a while and is flat and quiet. A nice place to spend a night, just me and my paved donut... and my smartphone with surprisingly good service given my semi-remote location. As I sat in the driver's seat of my Subaru sifting through trip reports and maps on my 2-inch by 3-inch smart phone screen I wondered if I could find anything suitable for my 4 days for freedom. Ritter and Banner? Too short. Ionian Basin? Too far. Whitney area? No permits. Hmmm..... The battery on my phone was dying quickly and the screen starting to flicker ever so slightly from overuse. After what seemed like forever, but was probably less than an hour, I found something that would work. I had never been over Piute Pass and there was a bounty of relatively easily accessible peaks from this point of entry to the high country. After reading through more trip reports I had come up with a plan. It involved five peaks, a decent amount of cross country, a lot of time above 11,000' and it would start tomorrow morning. I fell asleep that night on my donut feeling good about what I was about to attempt. Friday morning I woke up and drove to the permit office in Bishop to hopefully attain a permit for Piute Pass. I spoke with a clearly annoyed ranger who was a bit short with me when I asked about getting a permit for today. "Nope, there's nothing. South Lake, North Lake, Sabrina, they're all full. Come back at 11 at try and get one for tomorrow. You're ninth on the waiting list." Bummer. It was a little after nine and I had to pack, make my lunches and otherwise get ready for a 4 day trip so I decided to wait until 11, get a permit for tomorrow and hope to not get caught when I started hiking today. I sat in the parking lot making sandwiches in the ever warming temperatures of the Owens Valley. I had the unpleasant experience of finding out my bottle of honey had decided to rupture at some point during the drive over Tioga Pass and created a sticky mess at the bottom of my food bag. Note to self: always ensure bottles of honey are secured in an upright position when going on a road trip. I returned to the office at 11 with my bag fully packed and ready to hit the trail. The office looked different now with ten other parties also there to secure permits for tomorrow. "Is there anyone here who would like try start their trip today?" Asked the ranger man. "Me!!" I called back. "There are seven spots open on the Piute Pass if you want to go that way." Amazing what a difference two hours makes. From no spots to seven just like that. I got my permit and headed uphill, arriving at the North Lake trailhead shortly before noon. For some reason there are no bear boxes at North Lake. Since I was sure there would be some kind of food storage up there and had a bag full of food that I did not want to just throw away. After some pondering I threw away open jar of peanut butter as well as anything that had honey on it and rolled the dice hoping the rest of it would remain uneaten by a furry black bear in need of calories before its winter slumber. I was on the trail by 12:30 on a trail I had never been up before. Maybe it was because I had not packed at all lightly, carrying 8 sandwiches, 2 pounds of pasta, a pound of cheese and 8 energy bars, or maybe because I wasn't overly used to carrying much more than a daypack, but the first half of the trail was a bit brutal. Especially the very tall steps before you get to Loch Leven. Regardless, I trudged my way uphill and reached the pass in a very damp condition in the near windless and sunny surroundings that existed on this fine end of August afternoon. Dropping down the west side of the pass I passed Summit lake and bared right at an obvious intersection perhaps a mile from the pass. After another half mile or so I passed a small creek and came upon an unsigned and somewhat faint trail heading to the right. I accurately assumed this to be the trail to Desolation Lake and took the fork. After about a mile I saw Lower Desolation Lake to the west and left the trail to get to this fine looking water body. Upon reaching the lake I noticed how low the water was. I was able to cross on rocks on the south side of the lake that were clearly submerged most of the year. Finding a nice flat spot on the west side of the lake I set up camp and planned my next move. To the northwest, perhaps two or three miles away, was the rounded summit of Four Gables. It looked simple enough. Just a walk uphill through open grassy meadows and around alpine lakes to the summit of what would otherwise be a nondescript highpoint if not for its distinction on the SPS list. With Mt. Humphreys looking tall and imposing to the east Four Gables looked quite small and unimpressive but it was part of my itinerary so it must be conquered! I left my peaceful campsite and headed uphill towards the destination. The going was simple and quick. Coming from Desolation, head for the highpoint on the ridge south east of Four Gables and traverse below the ridge and into the grassy and rocky terrain that leads to the summit. The going is all class 1. At one point I found myself in some serious class 2 terrain but was able to walk downhill five feet into the sand and grass to keep the going at class 1. Whew! There was not summit register on Four Gables but there was a perfectly placed boulder for napping; protected from the wind and at just the right angle to induce dozing. After a short cat nap I took a few summit pictures and then returned to camp. That evening I was treated to an extremely fine sunset with high clouds turning all sorts of colors over Mt. Humphreys. Day 1 was in the books! I awoke lazily on Saturday. One nice thing about being solo is that I can make my own schedule and don't have to get up at horrendously early hours. I'm on vacation; I don't want to get up at 5! I got out of my tent at 8:30 and started hiking by 9:30. I headed west over undulating terrain towards the saddle between Pilot Knob and the ridge to the east. The going was easy, but a bit annoying. You have to go up and then down a couple hundred vertical feet through small basins a number of times before you reach the base of the pass. I stayed moderately high and traversed perhaps two hundred feet above the lake at the foot of the southern side of the pass. Reaching the pass was a simple class 1 walk uphill. Once here I dropped my pack and scrambled up to the summit. The peak looked very close from the pass but took longer than I expected to reach. Following the ridge for the first half of the climb is preferable and then dropping onto the southern side of the ridge to attain the summit would be the best plan of attack. The boulders get larger the higher you get, but the terrain should never get harder than class 2. The summit offered splendid views in all direction but no suitable napping boulders this time around. After a nice break on the summit I returned to the pass and dropped down the north side. This side is more difficult, but only about 400 vertical feet in length making. The route down is a mix between a use trail and boulder hop. Nothing terribly technical just not as quick or easy as what they rest of the trip had been. I did not hike far from the pass before setting up my tent on the western shore of Alsace Lake and ate a quick lunch. Looking at the map and the distances and the terrain I determined I had enough time to make it to Merriam and Royce Peaks today. I left the lake and headed for the obvious depression on the ridge on the north side of the lake. From here it was an easy descent to the lake basin below where I quickly met up with a use trail that took me to the L Lake trail and then down to the Pine Creek Pass Trail. I hiked the trail to Pine Creek pass as then made a left and headed for Royce Lakes. The cross country from the pass to the lakes is easy. You have the mountains in plain view the whole time and the terrain gently slopes uphill making progress quick. In Secor's book it describes the pass, Merriam Col, as ice axe required. I had brought an ice axe but was hoping to avoid using it at all. Once I crested the final rise to the lakes my hopes were realized when I saw the snow field that often encompassed the entire route up to the pass was now split into two small snowfields trapped in the deepest northeastern corner of the pass with a clear and obvious route to the col. Being a drought year and at the end of the season this was not all that surprising, but I would surmise that an ice axe would be required in any normal year well into August. 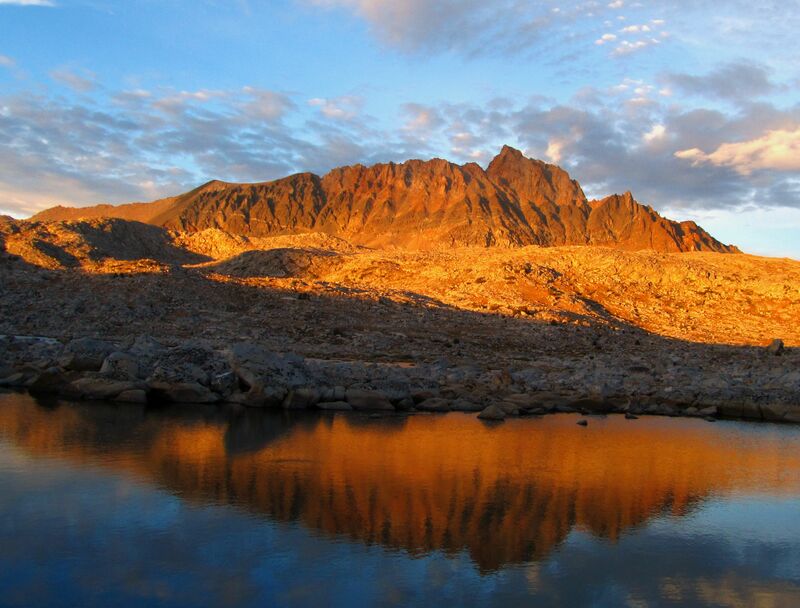 I crossed the southern Royce Lake around its southern bank and headed up to the pass over boulders, scree and sand. The high amount of sand on the rocks in the upper reaches of the slope indicated to me that this area is normally under snow. Reaching the pass was not difficult but from it there was still about a thousand feet of elevation to each peak. I bit more than I was expecting. I looked at the time and realized I would need to move quickly to attain both peaks and still return to camp before darkness fell upon the land. I decided to really go for it up Royce and red line it the whole way. The route is simple; head uphill to the highpoint over sand and rock. Off I went, speeding up the slope as fast as I could. The high amount of loose sand was thoroughly annoying but the sand relented the higher I got and turned it solidi 2nd class climbing nearer to the top. I tried to ignore the burning in my legs and chest and made it to the summit in an unhuman-like 31 minutes. The nausea and lightheadedness was totally worth it (not). I did not find a register and I did not spend much time on top as the wind was howling and I still had another peak and a moderately long walk ahead of me. Going down was a piece of cake as the sand made the travel quick. Back at the saddle less than an hour after I left I headed back up, this time to the summit of Merriam. It is preferable to traverse a few hundred feet southwest before starting the ascent of Merriam from the saddle as the terrain gets better the farther you go in that direction. It is certainly possible to head up straight from the saddle but the terrain is steep and likely a bit more that class 2. I made this short traverse and then headed up over terrain similar to that of Royce. There was a little less sand and a few more rocks on Merriam so the going was a bit more pleasant but still a touch on the annoying side. I took a more normal pace this time around and made it to the summit over nice 2nd class rock in a more human-like 47 minutes. The wind was howling even worse on this peak so I quickly signed the register and then dropped down 50 feet to a less windy location for a quick break before returning to the saddle. After picking my way back down to flatter terrain I crossed Royce Lake on the north side this time around and made quick work of the 4 mile walk back to camp, arriving as the last rays of sunshine were departing the higher peaks around me and having climbed 3 SPS peaks in one day for the first time. I awoke Sunday morning to perfectly blue skies and warm temperatures for 11,000 feet. Today I anticipated a rather mellow day. Just a quick backpacking over the pass and then to Summit Lake followed by a romp up Mt. Emerson. After a leisurely start I pack up camp and headed over same pass I crossed just yesterday. The pass on this side was a bothersome mixture of loose rock, sand and use trail. Luckily it was on 400 vertical feet from bottom to top so my frustration didn't get too out of hand. From the top it was back the way I came the day before. The rolling terrain was also bothersome. I was clearly tired from the long day the day before. I arrived at Summit Lake and set up camp on the fine looking north shore, a few feet away from the snow survey marker. Once my tent was up I commenced loafing activities by taking a nap in the warm sun. My motivation was not high today but after an hour or so I decided I should give Emerson a go. It was so close; it couldn't take more than a few hours, could it? The only description I had of the West Ridge was that of a picture I had taken from Secor's book. I had not read any reports on the West Ridge. As I walked uphill from Piute Pass toward Emerson my motivation waned further. The rolling terrain continued up here and the continuous slight ups and downs were getting to me now. I arrived at the base of the mountain and pondered my options. The face looked impossible and the ridge did not look much easier. The route description said to go up the talus fan and then up a "hidden" gully to the ridge. I saw the talus fan but did not see anything remotely possible from there. Hmmm... To try it or not to try it... Well, I had hiked this far so I may as well go for it. I cruised up the talus fan on rock and sand that went from stable to a bit loose to horrendously loose. I only noticed one other set of foot prints in the fan. Probably a bad sign given the time of year. I looked around for hidden gully but found only an obvious ramp on the right. Thinking that wasn't it I ascended to the ridge and found nothing but 5th class terrain. The only possible way was that ramp so I went back down and ascended it. While in this ramp I pulled on a boulder that likely weighed more than I did. It began slowly sliding towards me and I was directly in the fall line. I push back against it with all my mite and it stopped its slide on a small lip a few inches before it would have gone over a small drop and been unstoppable. That was lucky. A bit rattled by that potentially serious situation I continued up the ramp. Did I really want to climb this peak? The ramp dropped me in a higher talus fan and I still didn't see any ramps or chutes that were easier than 5th class. I crossed the fan and looked at each chute, hoping one of them would go. I traversed until I could not traverse any farther and decided to attempt one ramp that looked 3rdish class at the bottom. I ascended 100 feet or so before the climbing got more serious and turned back. It was probably 4th class but I was in no mood to do anything too daring. By this time I had pretty much decided that this peak was not going to happen. On my traverse back to the ramp I came in from I noticed something I did not see before. At the very top left corner of the talus fan there was a small notch that looked ascendable. It was hidden from me before but now I could see it clearly. I walked over and ascended it through painfully loose sand and dangerously loose rocks. There were no footsteps in the sand and given the looseness of everything around here I did not have much hope this would go anywhere. Suddenly though I saw something peculiar. It was a rock on top of another rock on top of another rock. And there was another structure like this a little higher up! No turning back now, I found the route! The last party did a fine job of marking the route and small cairns existed all the way up the west ridge. There is no obvious chute or ramp to follow on your way up, rather just take the path of least resistance and enjoy it! Near the bottom of the ridge will be the main test of you climbing abilities as it is necessary to climb a 30 foot granite slab at about 50-60 degrees with an extremely serious fall potential. There are huge hand holds but not huge foot holds. If you make it past this obstacle you'll have no problem on the rest of this 3rd class route. I knew it was a ways from the top of the ridge to the summit so when I topped out and saw the peak a solid half mile away I was not too put off by it. I began my traverse by staying on the ridge but it is necessary to drop below it on the southern side from time to time to avoid harder sections. At the end of the ridge you have to drop down to a col before ascending the final section to the peak. This section is super fun and offers crazy exposure. To your left you have a ridge with a 1000+ foot drop and on the right you have an ever steeping slope that eventually sends you over the cliffs far below. The climbing is easy but the exposure makes you pay attention. From the col I traversed approximately 200 feet and then ascended back to the ridge. I followed the ridge, which was just a walk at this point, up over sand and rock. The peak was close and I was happy. I made my final push to the summit and.... Oh no!!!! This isn't the peak at all! The peak is another half mile away over jagged ridgeline. Looking at the clock I realized, once again, I would have to more quick to get this done before it got dark. I set a turnaround time and set off. The first part of the ridge is a walk but soon 2nd and 3rd class climbing is required. You can follow the ridge exactly until you get to the last two bumps and which point you need to drop down and around on the southern side of the ridge. Once you get directly below the summit block you will have to drop down approximately 100 feet and traverse to the east side of the peak through a couple not so obvious ramps. Once this is done a few 3rd class moves and an airy walk along the summit ridge will get you to the top. Finally! With 5 minutes to spare before I needed to turn around I made it. Joy! I signed the register and after a quick snack and photo I headed back the way I came. After renegotiating all the obstacles I encountered on the way up I gave that big boulder that almost squished me a light kick and it went careening down the slope and broke into 3 pieces 100 feet from its original location. Glad that didn't happen when I was in its path. I arrived back at camp with about 15 minutes of daylight left. So much for an easy day. The west ridge is a super fun and enjoyable route but it is very long and requires a full day for most parties. I did it from to camp to camp in 6 hours and I move very quickly so don't take this route lightly. In brief, walk up the talus fan at the base about half way and take an obvious ramp to the right. When the ramp drops you in a higher talus fan head directly left and uphill to an unobvious notch. Climb the notch and find the ridge and the cairns. Follow the ridge for ever and ever and sooner or later you'll make it to the summit! After having my plans fall through at the last minute I was rather happy with how this trip and this weekend turned out. 5 peaks in 3 days and lots of time above 11,000 feet. This was my last trip to the high sierra this season and it was certainly a great success!